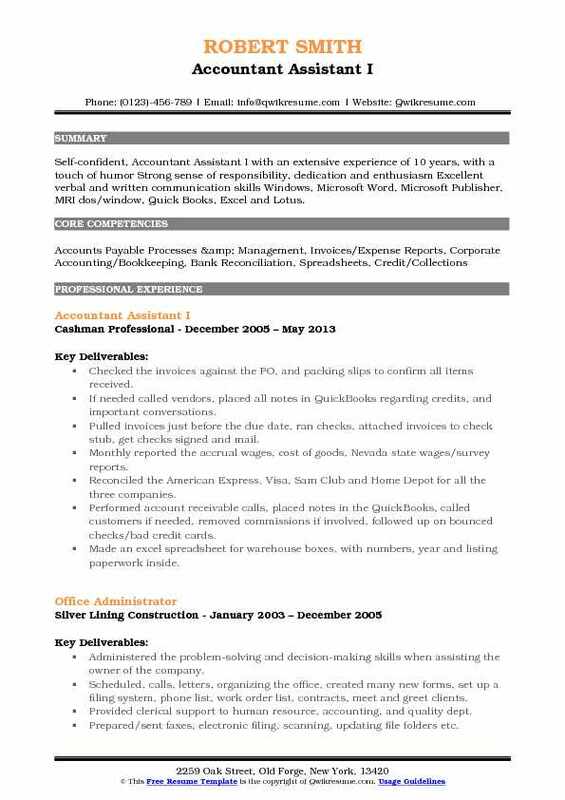 An Accountant Assistant is hired basically to assist the chief accountants in day to day accounting tasks. Typical duties shouldered by the Accountant Assistant include the following – managing expense report and reimbursement process, entering financial transactions in database, reconciling invoice, creating and updating database, processing reimbursement forms, identifying discrepancies, preparing bank deposits, checking spreadsheets, entering financial transactions, maintaining financial and digital records, issuing invoice, file payroll documents, and participating in annual audits. 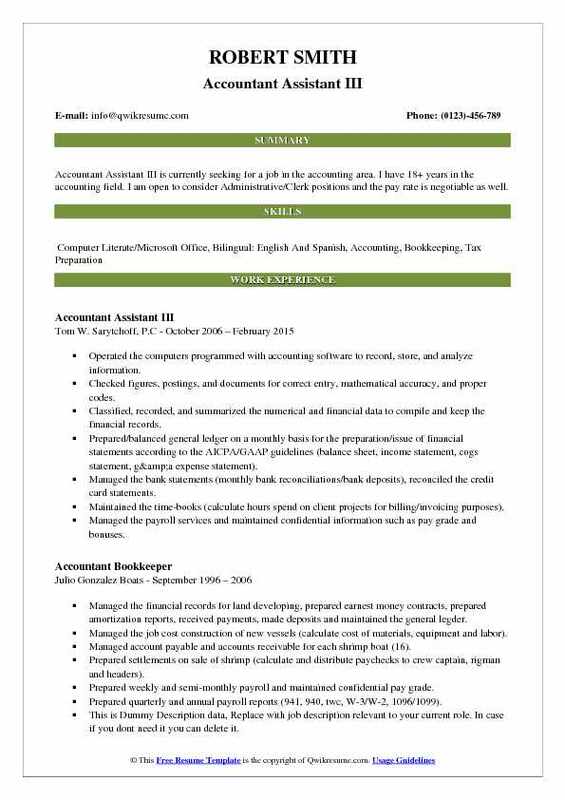 The qualities expected in the Accountant Assistant Resume are – knowledge of bookkeeping procedures, familiarity with finance regulations, the ability to spot numerical errors, good math skills, hands-on experience with accounting software and MS Excel, organizational skills and the ability to handle sensitive and confidential information. Graduates with a degree in accountancy or finance having a great interest in this line of operation can consider being an accounts assistant. Summary : Accountant Assistant with 20 years of combined experience in the Architecture domain is seeking to obtain a challenging position in the field of Accounting and Bookkeeping. Detail oriented, with a strong drive for quality and solid understanding of Accounting and Bookkeeping. Responsible for setting up new vendor and employee accounts through Macola system coding, processing vendor invoices in the A/P system and coding within General Ledger. Tasked with overseeing the cutting and posting of checks to the check register, voiding checks, processing expense payments and travel advances and disbursing the payroll. 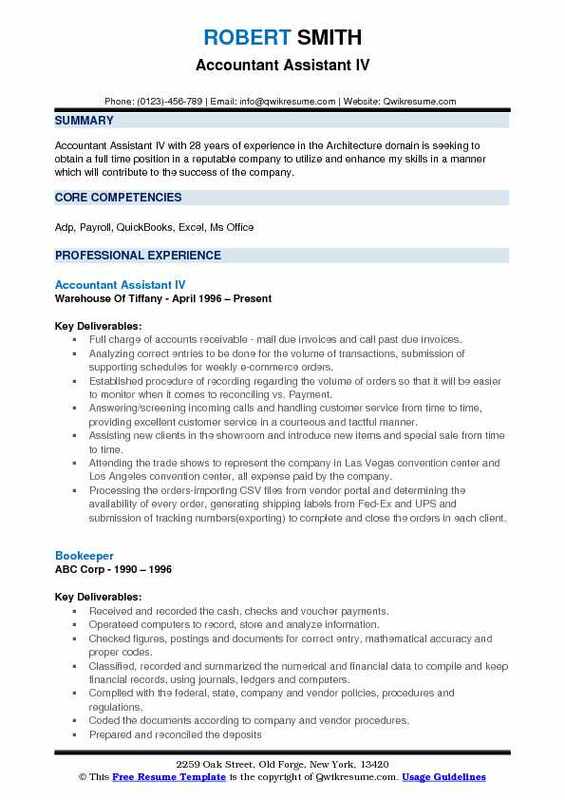 Additional duties including cash receipt processing, payments of payroll taxes, preparation of annual 1099 and 1096 forms, maintenance of A/P employee files and audit research. Reconciling the balance sheet accounts and preparing the analysis to support account balances. Providing support to the other accountants in the group, financial analysts, others within the corporate areas. Ability to be assertive to follow up on issues and responsible for adhering to deadlines. Performing the full cycle A/P, cash posting and expense report processing, daily cash deposits for the bank(s). Ensuring the accuracy of billing and shipping addresses on past due invoices, EZ-pays, personal orders, and other incoming payments. Summary : Accountant Assistant IV with 28 years of experience in the Architecture domain is seeking to obtain a full time position in a reputable company to utilize and enhance my skills in a manner which will contribute to the success of the company. Full charge of accounts receivable - mail due invoices and call past due invoices. Analyzing correct entries to be done for the volume of transactions, submission of supporting schedules for weekly e-commerce orders. Established procedure of recording regarding the volume of orders so that it will be easier to monitor when it comes to reconciling vs. Payment. Answering/screening incoming calls and handling customer service from time to time, providing excellent customer service in a courteous and tactful manner. Assisting new clients in the showroom and introduce new items and special sale from time to time. Attending the trade shows to represent the company in Las Vegas convention center and Los Angeles convention center, all expense paid by the company. Processing the orders-importing CSV files from vendor portal and determining the availability of every order, generating shipping labels from Fed-Ex and UPS and submission of tracking numbers(exporting) to complete and close the orders in each client. Using QuickBooks in generating invoices and exporting data to use in balancing/reconciling accounts. 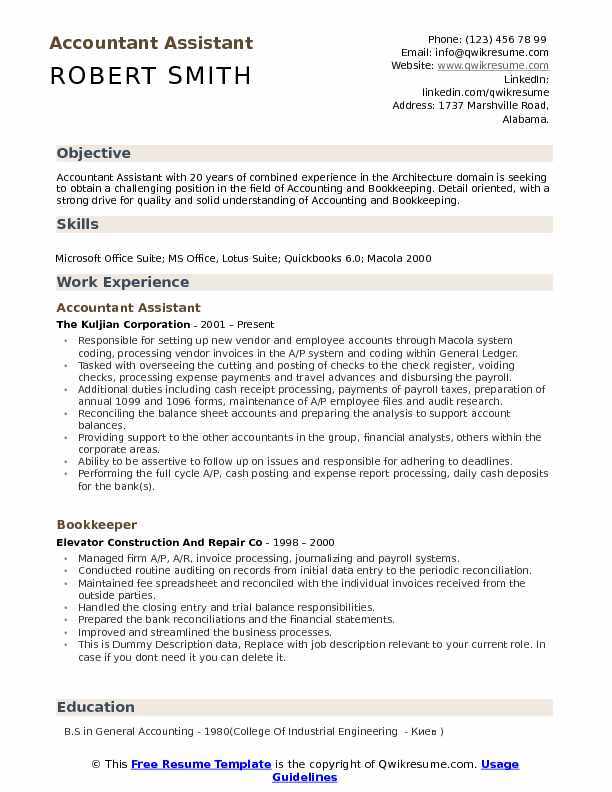 Summary : Accountant Assistant III is currently seeking for a job in the accounting area. 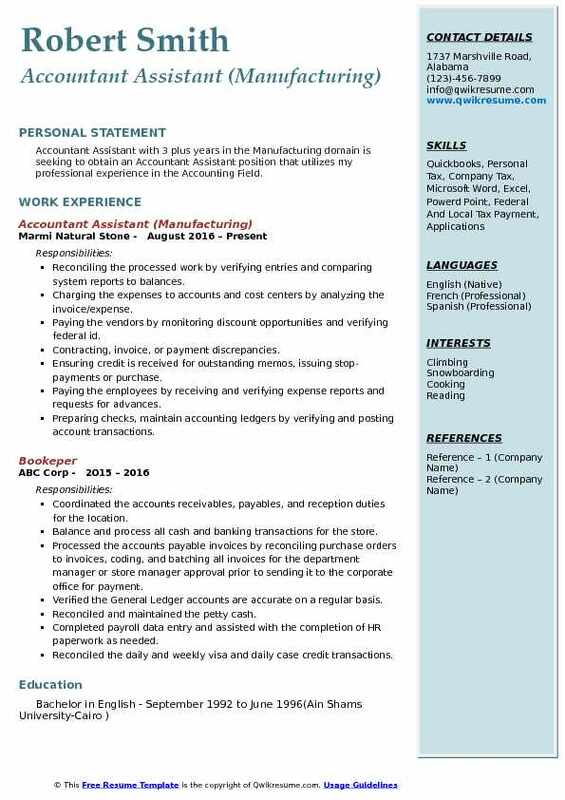 I have 18+ years in the accounting field. 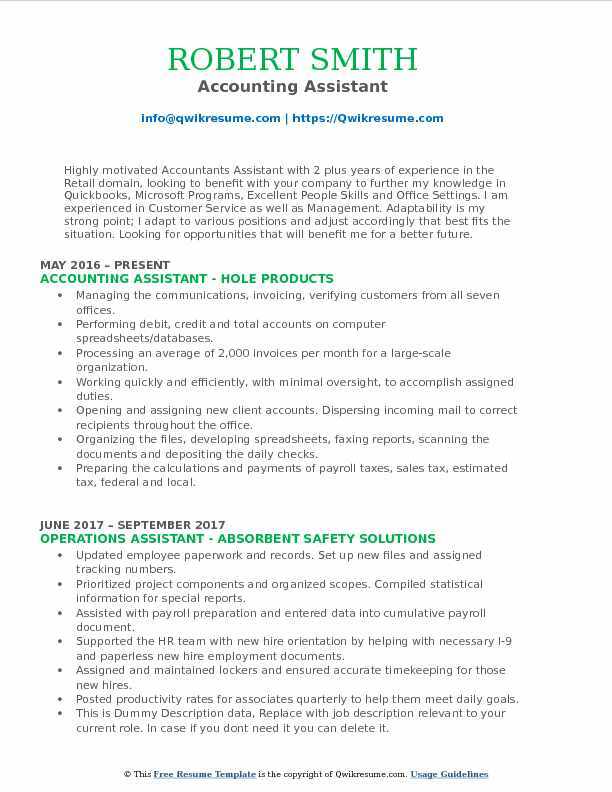 I am open to consider Administrative/Clerk positions and the pay rate is negotiable as well. Operated the computers programmed with accounting software to record, store, and analyze information. Checked figures, postings, and documents for correct entry, mathematical accuracy, and proper codes. Classified, recorded, and summarized the numerical and financial data to compile and keep the financial records. Prepared/balanced general ledger on a monthly basis for the preparation/issue of financial statements according to the AICPA/GAAP guidelines (balance sheet, income statement, cogs statement, g&a expense statement). Managed the bank statements (monthly bank reconciliations/bank deposits), reconciled the credit card statements. Maintained the time-books (calculate hours spend on client projects for billing/invoicing purposes). Managed the payroll services and maintained confidential information such as pay grade and bonuses. Prepared quarterly and annual payroll reports (941, 940, TWC, W-3/W-2, 1096/1099). Performed administrative tasks and office duties such as: answered telephones and gave information to callers, took messages, or transferred the calls to appropriate individuals. Created, maintained, and enter information into databases. 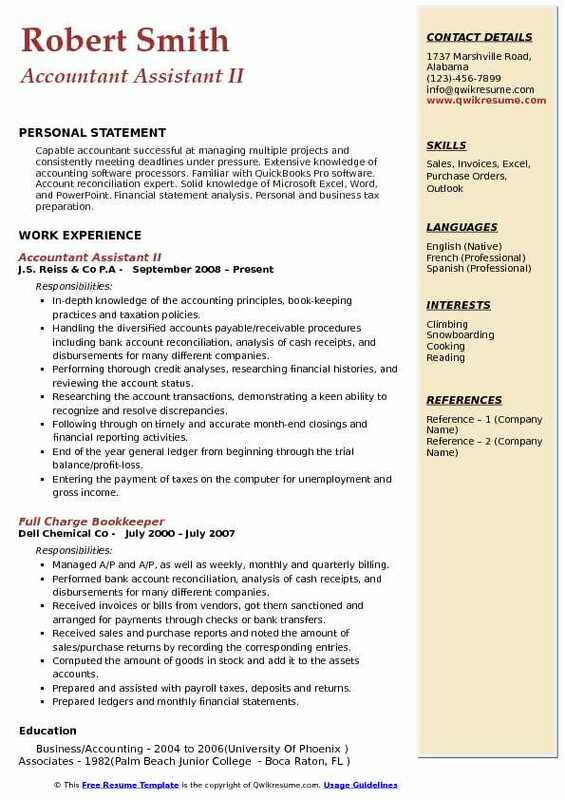 Headline : Accountant Assistant with 6 years of experience in the Finance domain is seeking for a full time job in a position that will provide me the chance to employ my interpersonal, administrative and communicative skills. Completed payroll, month-end data entry, reconciliation, and profit and loss reports for corporate clients. Reconstructed accounting records from clients checks and cash receipts. Provided extensive customer service and maintained client confidentiality. Greeted clients, answered phones, made copies, filed, set appointments. Formulated the IRS and Florida Department of revenue reports: 941-940-rt6. Performed bookkeeping for all financial transaction for the firms clients. Assisted the clients with cash flow planning, cash flow and lines of credit. Assisted the clients to prepare accounting for year-end state and federal tax returns. Handled collections, contacted the clients regarding invoice issues, payment problems, and discrepancies. Processed deposits and incoming clients payments including, secure credit card payments. 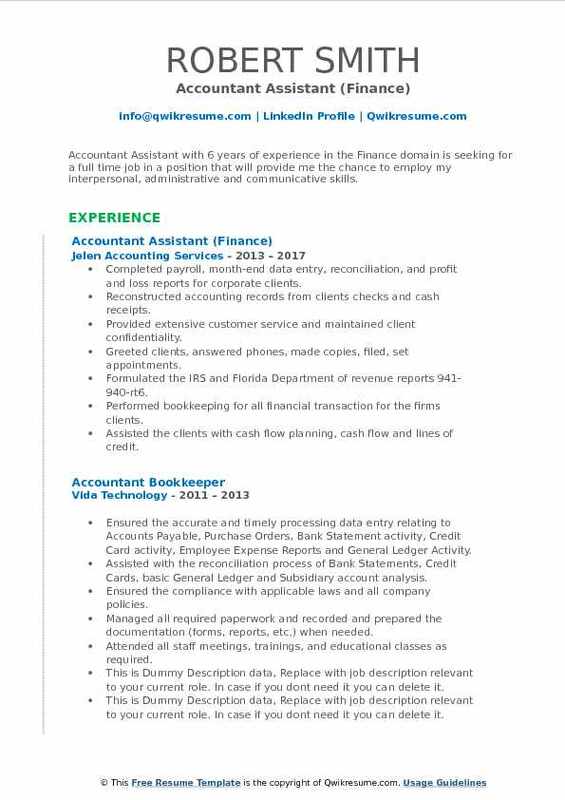 Objective : Accountant Assistant with 3 plus years in the Manufacturing domain is seeking to obtain an Accountant Assistant position that utilizes my professional experience in the Accounting Field. Reconciling the processed work by verifying entries and comparing system reports to balances. Charging the expenses to accounts and cost centers by analyzing the invoice/expense. Paying the vendors by monitoring discount opportunities and verifying federal id. Contracting, invoice, or payment discrepancies. Ensuring credit is received for outstanding memos, issuing stop-payments or purchase. Paying the employees by receiving and verifying expense reports and requests for advances. Preparing checks, maintain accounting ledgers by verifying and posting account transactions. Verifying the vendor accounts by reconciling monthly statements. Providing superior customer service when maintaining accounts by identifying, verifying, and recording transactions. Responsible to provide general accounting, accounts payable, billing, accounts receivable, and payroll functions in compliance with accounting policy and regulations for multiple ongoing client engagements. Objective : Detail-oriented and qualified Junior Accountant Assistant professional with extensive knowledge of accounting principles. Key strengths in maintaining high level of accuracy and efficiency, problem solving, and customer relation. Core Qualifications Proficient in MS Word, Excel, Power Point and Outlook Proficient in QuickBooks and Sage 50, and meticulous in all paperwork and data entry Strong mathematical and analytical skill Excellent communication skill and a team player. Preparing and recording journal entries and general ledger, and maintaining accurate accounting records and files. Managing account receivable aging report and conducting the monthly bank reconciliation. Handling cash and deposit using the proper accounting procedures and documentation. Receiving the payment from customers via cash, check and credit cards, and paying the company invoices. Preparing payroll tax reports, TWC reports, and sales reports. Timely filing of the payroll tax and sales tax for over 50 customers every month. Preparing financial documents such as invoices, bills, and accounts payable and receivable. Filing, typing, basic bookkeeping, handling mail and making phone calls. Reconciling the direct debits and finance accounts. Welcoming and assisting the customers in person and via phone, and answer customer inquiry. Order office supplies and maintaining the office equipment. Performing other administrative duties when requested. 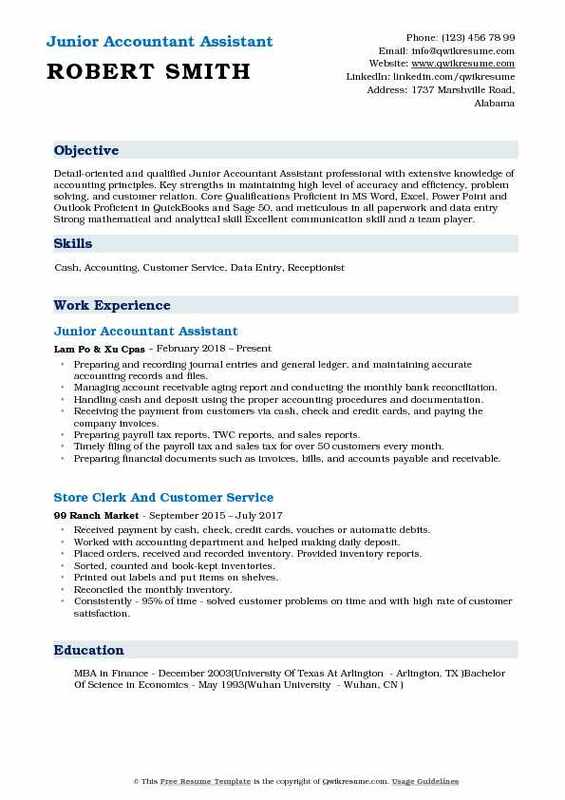 Objective : Highly motivated Accountants Assistant with 2 plus years of experience in the Retail domain, looking to benefit with your company to further my knowledge in Quickbooks, Microsoft Programs, Excellent People Skills and Office Settings. I am experienced in Customer Service as well as Management. Adaptability is my strong point; I adapt to various positions and adjust accordingly that best fits the situation. Looking for opportunities that will benefit me for a better future. Managing the communications, invoicing, verifying customers from all seven offices. Performing debit, credit and total accounts on computer spreadsheets/databases. Processing an average of 2,000 invoices per month for a large-scale organization. Working quickly and efficiently, with minimal oversight, to accomplish assigned duties. Opening and assigning new client accounts. Dispersing incoming mail to correct recipients throughout the office. Organizing the files, developing spreadsheets, faxing reports, scanning the documents and depositing the daily checks. Preparing the calculations and payments of payroll taxes, sales tax, estimated tax, federal and local. Preparing the monthly and annual expense forecasts, including any necessary recommended action required to manage. Receiving, recording, and banking cash, checks, and vouchers as well as reconciled records for the bank transactions. Summary : Self-confident, Accountant Assistant I with an extensive experience of 10 years, with a touch of humor Strong sense of responsibility, dedication and enthusiasm Excellent verbal and written communication skills Windows, Microsoft Word, Microsoft Publisher, MRI dos/window, Quick Books, Excel and Lotus. Checked the invoices against the PO, and packing slips to confirm all items received. If needed called vendors, placed all notes in QuickBooks regarding credits, and important conversations. Pulled invoices just before the due date, ran checks, attached invoices to check stub, get checks signed and mail. Monthly reported the accrual wages, cost of goods, Nevada state wages/survey reports. Reconciled the American Express, Visa, Sam Club and Home Depot for all the three companies. Performed account receivable calls, placed notes in the QuickBooks, called customers if needed, removed commissions if involved, followed up on bounced checks/bad credit cards. Made an excel spreadsheet for warehouse boxes, with numbers, year and listing paperwork inside. Transferred all incoming calls to appropriate department, mailed all daily and monthly invoices, collected calls, process all incoming deposits to the appropriate accounts report directly to the Vice President. Summary : Capable accountant successful at managing multiple projects and consistently meeting deadlines under pressure. Extensive knowledge of accounting software processors. Familiar with QuickBooks Pro software. Account reconciliation expert. Solid knowledge of Microsoft Excel, Word, and PowerPoint. Financial statement analysis. Personal and business tax preparation. In-depth knowledge of the accounting principles, book-keeping practices and taxation policies. Handling the diversified accounts payable/receivable procedures including bank account reconciliation, analysis of cash receipts, and disbursements for many different companies. Performing thorough credit analyses, researching financial histories, and reviewing the account status. Researching the account transactions, demonstrating a keen ability to recognize and resolve discrepancies. Following through on timely and accurate month-end closings and financial reporting activities. End of the year general ledger from beginning through the trial balance/profit-loss. Entering the payment of taxes on the computer for unemployment and gross income. Using the correct coding for purchases and special projects and keeping a track of purchases. Performing the debit, credit and total accounts on computer spreadsheets/databases, using specialized accounting software. 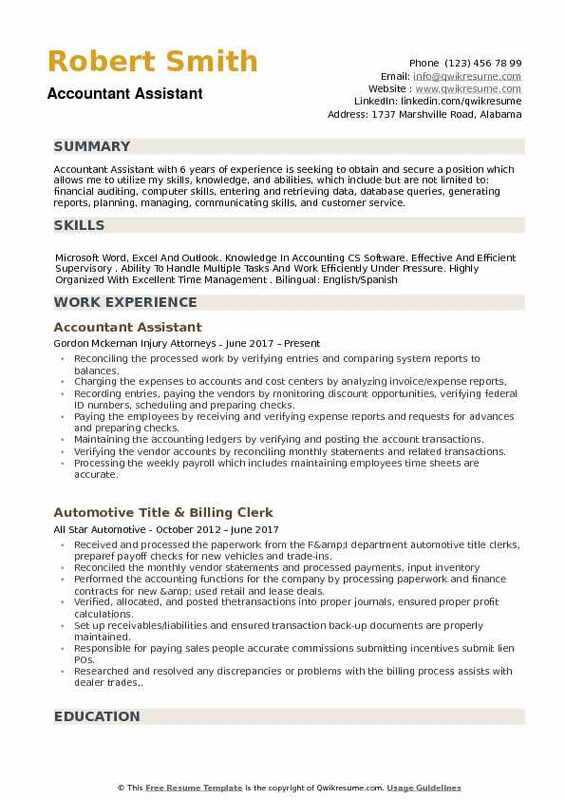 Headline : Accountant Assistant with 6 years of experience is seeking to obtain and secure a position which allows me to utilize my skills, knowledge, and abilities, which include but are not limited to: financial auditing, computer skills, entering and retrieving data, database queries, generating reports, planning, managing, communicating skills, and customer service. Recording entries, paying the vendors by monitoring discount opportunities, verifying federal ID numbers, scheduling and preparing checks. Paying the employees by receiving and verifying expense reports and requests for advances and preparing checks. Maintaining the accounting ledgers by verifying and posting the account transactions. Verifying the vendor accounts by reconciling monthly statements and related transactions. Processing the weekly payroll which includes maintaining employees time sheets are accurate. Ensuring the confidentiality and security of all financial and employee files.